Air Europa is ignoring the current Spanish headwinds and launching three new short-haul routes from Madrid-Barajas Airport, a strategy which sets it apart from larger and lower-cost competitors such as Ryanair and easyJet which both have announced route cancellations for Madrid as the economy in Spain further deteriorates and as airport charges were raised. The new Air Europa routes are Madrid to Brussels, Valencia and Bilbao. Iberia is the market leader on all three routes and enjoys a monopoly position on Madrid to Valencia, which is operated by its regional affiliate Air Nostrum. Air Europa, a full service network carrier and a subsidiary of Spain’s largest travel and tourism company Globalia group, is building a hub at Madrid as it most likely sees opportunities in the troubles hitting its main Spanish competitor. Iberia has been paralysed in its efforts to reduce costs by the combative SEPLA pilots union that stubbornly continues to resist the creation of Iberia’s low-cost subsidiary Iberia Express, which launched in Mar-2012. Iberia is now awaiting implementation of a comprehensive restructuring programme, imposed by its parent International Airlines Group (IAG). While details of the turnaround plan are not yet publicly released, Iberia management has informed labour unions that capacity on domestic routes will be trimmed by 2% and services to Europe will be cut by 4% in the winter 2012-2013 schedule. Despite its origins as a leisure carrier, and continuing ties to the tourism content of its parent company, Air Europa has gradually shifted its focus to scheduled flights. The carrier, which joined SkyTeam in Sep-2007, is a relatively small player in the Spanish market and currently accounts for only about 5% of total system capacity deployed in or to/from the country. The largest airline in Spain in terms of seat capacity is Ryanair, followed by Iberia, Vueling, easyJet and airberlin. 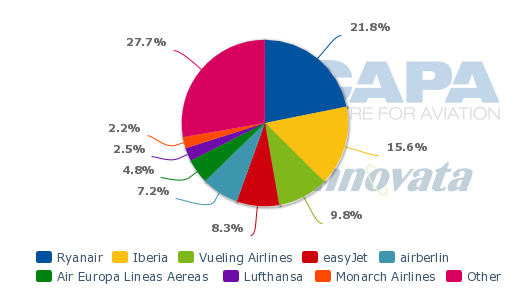 LCCs have a market leading position in Spain and account for about 56% capacity share (seats) on international routes and an approximate 46% share on domestic routes, based on OAG data for the first nine month of 2012. Air Europa does not brand itself as a budget airline and increasingly positions itself as a network carrier building a hub-and-spoke operation at Madrid. The airline’s three new short-haul routes are part of this process. The airline is seeing only a limited benefit from the void left by Spanair, which ceased operations on 28-Jan-2012, in the international short-haul market. Spanair’s international operations were largely centred at Barcelona El Prat Airport, and consequently it did not have a large operation at Madrid, where Air Europa is building a hub. In the week preceding its bankruptcy, only one of Spanair’s ten largest international routes in terms of seat capacity touched Madrid (to Frankfurt, a destination not served by Air Europa). Unlike Air Europa, Spanair only served the short-haul market but overall was larger than Air Europa. 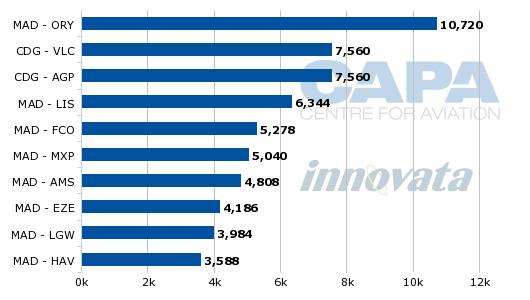 Just prior to its collapse Spanair accounted for 6% of total capacity (seats) in the Spanish market. Spanair’s former domestic market offers slightly more opportunities. Air Europa is filling the void left by Spanair on several domestic routes from Madrid, including to Valencia and Bilbao. Madrid to Bilbao, which Air Europa launched on 1-Oct-2012, was Spanair’s third largest domestic route in term of weekly seat capacity. Air Europa also has also enlarged supply on three former routes where it competed with Spanair: Madrid to Gran Canaria, Palma de Mallorca and Tenerife-Norte. On all three routes Air Europa has increased its share of weekly seat capacity. Between Madrid and the Balearic Islands, Air Europa currently operates on average six daily flights to Palma de Mallorca and one daily flight to Ibiza, according to Innovata data. In the Madrid-Canary Islands market, Air Europa now offers up to four daily flights to Gran Canaria and up to five daily flights to Tenerife as well as a less than daily service to Fuerteventura and Lanzarote. Air Europa also offers low frequency service to some destinations in the Canary and Balearic islands from other Spanish airports including Asturias, Barcelona, Bilbao, Santiago de Compestela, Seville, Valencia and Zaragoza (from Barcelona some relatively minor increases were implemented after Spanair’s collapse). 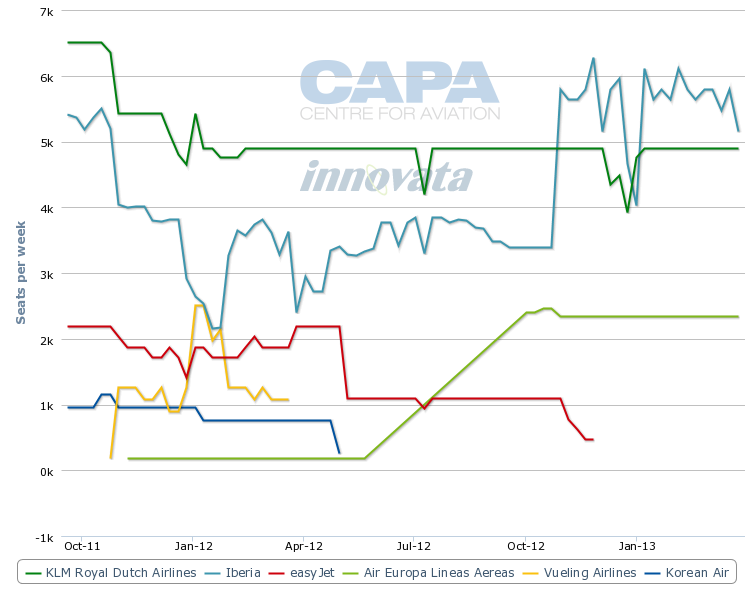 Air Europa deploys about 52% of its total seat capacity in the domestic market, according to Innovata data. The carrier currently accounts for about 11% of total capacity in the Spanish domestic market. This makes it the fourth largest domestic carrier in Span following Iberia, Ryanair and Vueling. Prior to Spanair's collapse, Air Europa was the sixth largest domestic carrier in Spain following Iberia, Ryanair, Spanair, Vueling and Binter Canarias. Spanair accounted for about 15% of capacity in the domestic market the week prior to its collapse, according to Innovata data. Air Europa at the time had an approximate 7% share of capacity. Of Air Europa's international seat capacity, about 66% is deployed on routes to/from western Europe. This equates to almost 56,000 weekly seats. The carrier's scheduled passenger network spans some 40 airports, including 20 domestic gateways, eight airports in Europe, eight in Latin America, two in Africa and one in North America (New York JFK Airport), according to schedules in Innovata for the week of 08-Oct-2012 to 14-Oct-2012. This compares to 106 destinations in Iberia’s network, of which 34 are domestic airports and 35 are in Europe. Several of Iberia’s short and medium-haul flights are operated by Air Nostrum, its independent regional affiliate that operates Iberia Regional, and its new wholly-owned lower-cost subsidiary Iberia Express. Iberia Express launched on 25-Mar-2012 and has replaced mainline Iberia on several of its short-haul routes. The airline’s summer schedule is heavy on domestic leisure routes with a sprinkling of leisure or second-tier international short-haul routes. But Iberia Express also has started to serve some trunk routes such as Madrid-Amsterdam and Madrid-Frankfurt. Air Europa accounts for just over 11% of capacity at Madrid, making it the second largest operator at the airport after Iberia. 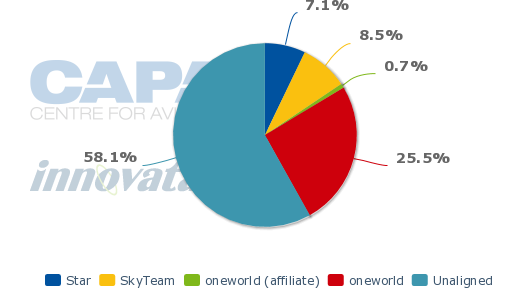 LCCs currently account for about 22% of Madrid's seat capacity, according to Innovata data. Air Europa and Iberia’s network overlap on several Madrid routes and Air Europa is competing with Iberia’s lower-cost subsidiary, Iberia Express, on an increasing number of routes including Madrid to Amsterdam, Fuerteventura, Gran Canaria, Ibiza, Lanzarote, Palma de Mallorca and Vigo. 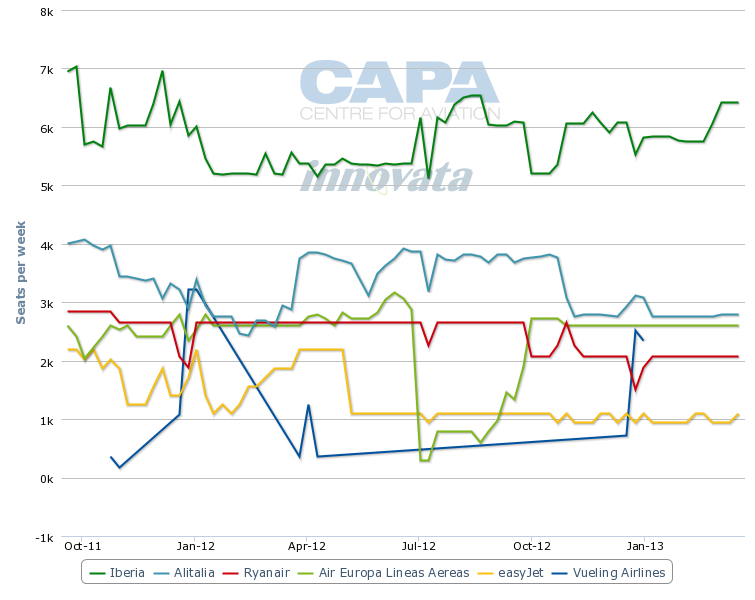 Air Europa competes with Iberia on seven of its ten largest international routes in terms of weekly seat capacity. Madrid-Paris Orly is both carriers’ largest route. Eight of Air Europa's top 10 international routes (based on seat capacity) are within Europe. Rome, Milan and Amsterdam are served by several airlines and competition is very intense with several LCCs operating on these routes. Madrid to Rome has five airlines deploying jointly about 15,000 one way seats, according to schedules in Innovata for the week of 08-Oct-2012 to 14-Oct-2012. Air Europa and fellow SkyTeam member Alitalia jointly have a leading share of seat capacity of approximately 44% on the city pair, and Iberia accounts for a 35% share. 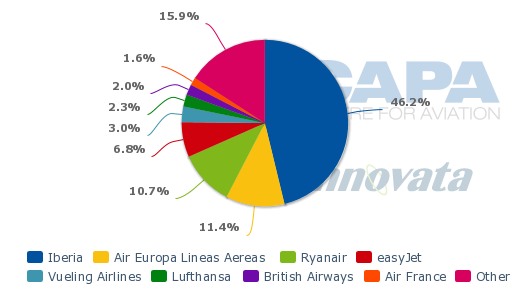 Ryanair is the only carrier of the five operating to Rome Ciampino and has a 14% seat capacity share. Competition to Milan is equally intense with five airlines offering some 15,000 one-way seats to three different airports (Malpensa, Linate and Bergamo/Orio al Serio). Air Europa, Alitalia, Alitalia Express and CAI Second give SkyTeam a near 21% share of the seat capacity deployed between the two cities, but Iberia has the market leading position with a 39% share. Iberia operates to Malpensa and Linate, while Air Europa flies to Malpensa and the Alitalia Group airlines to Linate. The number of airlines operating between Madrid and Amsterdam is sharply reducing, following the decision by Vueling to pull the route in Mar-2012 and easyJet cancelling the route as of 03-Dec-2012. This will leave Iberia, KLM and Air Europa competing in the market. The route accounts for about 11,800 one way seats, based on schedules in Innovata for the week of 08-Oct-2012 to 14-Oct-2012, down from approximately 15,000 seats in the week of 10-Oct-2011 to 16-Oct-2011. Air Europa intends to upgrade the route to an all Boeing 737-800 operation from 28-Oct-2012. It currently serves the sector with 12 weekly frequencies using a mix of 737-800s and smaller Embraer 190s. The airline on 23-Jul-2012 took delivery of its 19th new 737-800 with winglets, lifting its total operating fleet to 39 aircraft. It also operates 11 Embraer 190/195s and 10 Airbus A330-200s. Air Europa retired its last Boeing 767 in Apr-2012. Iberia has handed the Madrid-Amsterdam route over to its new low-cost subsidiary Iberia Express. 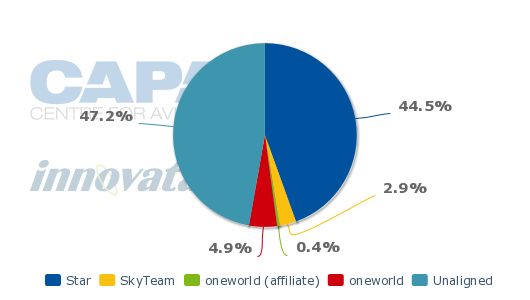 Air Europa SkyTeam partner KLM currently has a 42% share of the weekly seat capacity on Madrid-Amsterdam, Iberia represents an approximate 29% share, Air Europa 20% and easyJet accounts for about a 9% share. Note: Iberia figures include Iberia Express. Air Europa on 28-May-2012 announced it would commence a three times daily service on 01-Oct-2012 from Madrid to Bilbao using Embraer 190/195 aircraft configured with 120 seats. Schedules in Innovata, however, show that Air Europa is currently serving the route with four daily flights using ATR-72 turboprops wet-leased from Malaga-based Helitt Líneas Aéreas. Madrid-Bilbao is Iberia’s second largest domestic route in terms of seat capacity per week accounting for roughly 20,500 seats and 128 frequencies per week. The route is currently operated by Iberia, Air Europa, Ryanair and easyJet. But easyJet is suspending the service in Nov-2012. Spanair produced about 9,500 seats on the route before it collapsed on 28-Jan-2012. 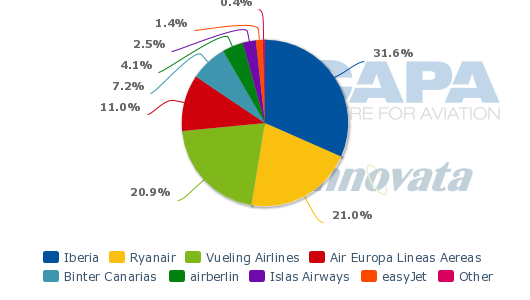 Before Air Europa entered the route, Iberia had a leading 58% share of weekly seat capacity with easyJet holding a 25% share and Ryanair 17%, according to schedules in Innovata. Air Europa has already captured a 12% share of capacity on this route. Air Europa will begin a four times daily Madrid-Valencia operation on 29-Oct-2012. The carrier has said it will use Helitt ATR 72s for this service. At present, Air Nostrum is the only operator of this route. Air Nostrum flights come under the Iberia Regional franchise brand. Madrid-Brussels will be launched on 03-Dec-2012 with two daily flights using Embraer 190/195. Madrid-Brussels is currently served by Iberia and Brussels Airlines operating to Brussels Airport and by Ryanair operating to Brussels South Charleroi. Iberia accounts for 62% of the seats between Madrid and Brussels Airport, based on schedules in Innovata for 08-Oct-2012 to 14-Oct-2012. When announcing the three new short-haul routes, Air Europa CEO Maria Jose Hidalgo explained they were “part of our strategy to offer more destinations in Europe and at the same time continue to provide passengers with good connections to our long-distance network over our hub in Madrid Barajas airport”. 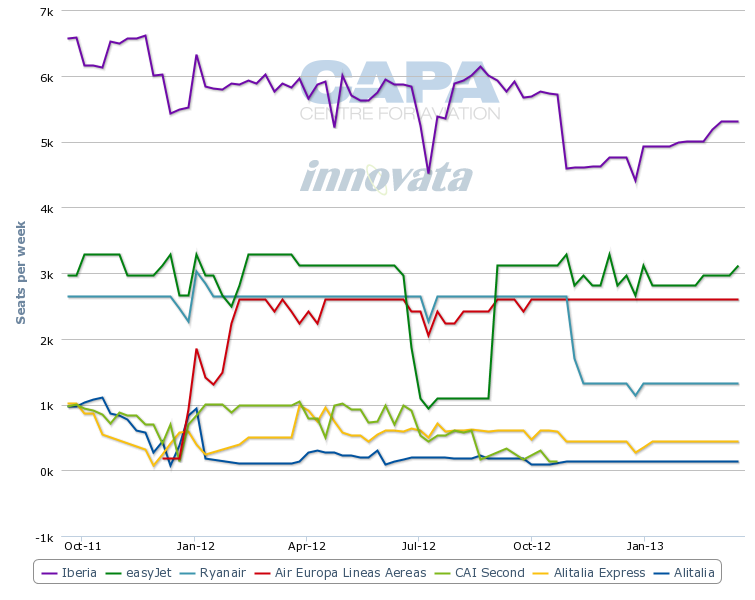 Mr Perez told CAPA in Jun-2012 that roughly 40% of Air Europa's traffic is transit. The carrier has been working in recent years in building its transit traffic, which a few years ago only accounted for 25% of its total traffic. Mr Perez says most of the growth in transit traffic has occurred as Air Europa has launched several new short-haul international routes from Madrid to Spain, allowing the carrier to offer more short-haul international to long-haul international connections. Both domestic to long-haul international and short-haul international to long-haul international connection traffic is now being pursued. The former accounts for about 25% of Air Europa's total traffic while the latter accounts for about 15%. The new Bilbao and Valencia to Madrid flights will help Air Europa further builds its domestic to long-haul international product, opening up several new one-stop itineraries that only Iberia now offers from these two cities to Latin America. The new Madrid to Brussels flight allows Air Europa to start competing in the one-stop Belgium-Latin America market. With the start of flights to the Belgian capital, Air Europa’s network of European destinations will comprise Brussels, Lisbon, Rome, Milan, Paris, London, Geneva and Amsterdam. The expansion of its network will benefit SkyTeam’s weak position in the Iberian Peninsula, where oneworld is the dominant grouping in Spain while the Star Alliance is the leading alliance in Portugal. Air Europa has chosen a careful expansion pace, with just six new routes this year, a mix of long-haul, domestic and European routes. However, expanding a hub in Madrid in the current negative economic and social environment in Spain marked by depressed demand is a daunting exercise. Globalia is a powerful group with revenue of EUR3.1 billion in its financial year ended 31-Oct-2011, but Air Europa posted pre-tax losses of EUR23 million in part due to the combination of the increase in fuel prices, competition from low-cost airlines and the euro’s loss in value against the dollar. Most of these headwinds have not changed and might push the airline deeper into the red.